But I decided against it and registered for the 8K instead. I could get myself in shape for a 5 mile run. 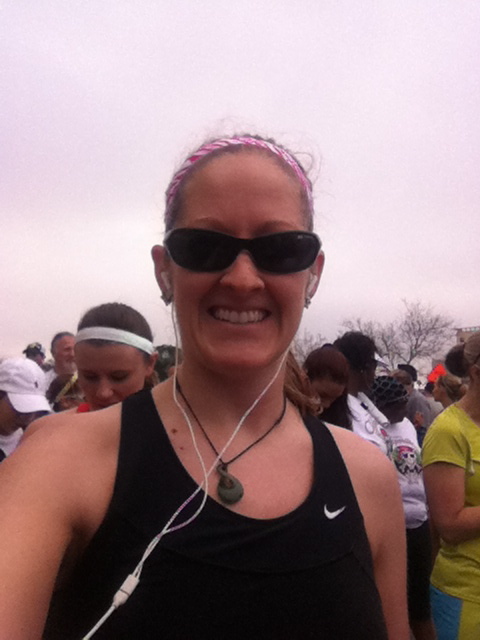 Sunday morning, I woke up at 7:30 to give myself enough time to eat, park, potty break and get to the starting line. The 8K was the second race of the day, so my start time was 9:00am. 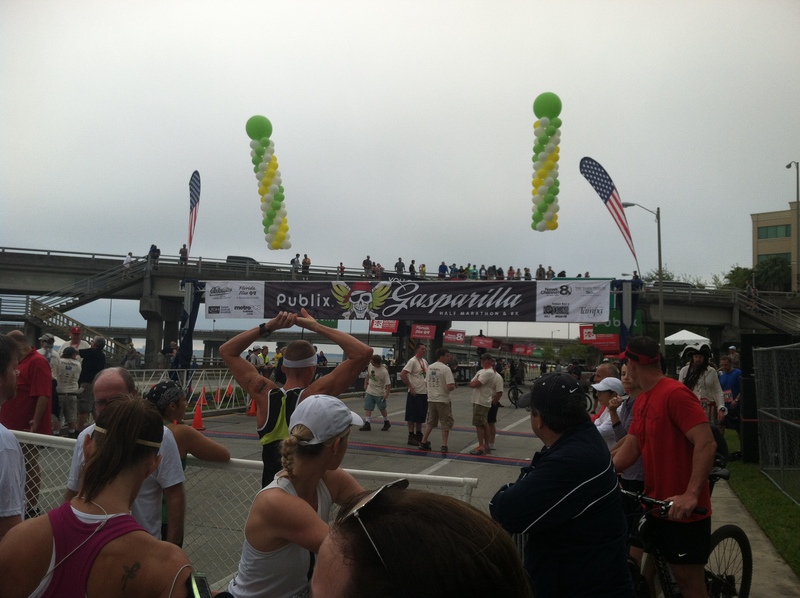 The half marathon was the first race of the day, and the gun went off at 6:00am! I got to the starting line with plenty of time to spare. One of the things I love about running races is that you just show up a few minutes before the start ready to go, instead of arriving HOURS in advance to set up all your gear in transition. Hmm, maybe I’m too close to the front. An 8:00 pace is awfully ambitious for me, but after waffling back and forth about going back to find the 8:30 group, I opted to stay here and see what I could do. I felt pretty rested, and despite riding 32 miles (with 2 fifteen minute intervals thrown in there, one of them into an awful headwind) and running a 3K yesterday, my legs felt surprisingly good. I’ve recently been delving into the world of compression, so maybe that had something to do with it? Regardless, I decided that I would try to stick with these guys for as long as I could. When the race started, the temperatures were hovering in the mid 70s and the typical Florida humidity had set in; however, there was a nice cloud cover and some fog which made it feel much more pleasant than it could have been. I started off with the pacer, and quickly found myself doing a little bit of dodging and weaving to get around the crowds at the start. In the mix, I lost sight of the pacer, but I knew he must have been only a few steps behind me. I fell into a groove- a fast groove. At mile 1, my watch beeped and I looked down and was shocked to see a pace that began with a “7.” Uh Steph, what are you doing? I backed off ever so slightly, but I figured my strategy for today would be to try and hold on. As we approached mile 2, the pacer came up along side of me and passed me. I worked hard to stay close to him, and tried not to let him go more than 15 feet or so ahead of me. Mile 2 dinged: 8:04. Ok, so I fell off a little, but I’ll take it! We hit the turnaround and the pacer started gaining some distance on me. I was not going to give up that easily, so I pushed a little harder. Beep! 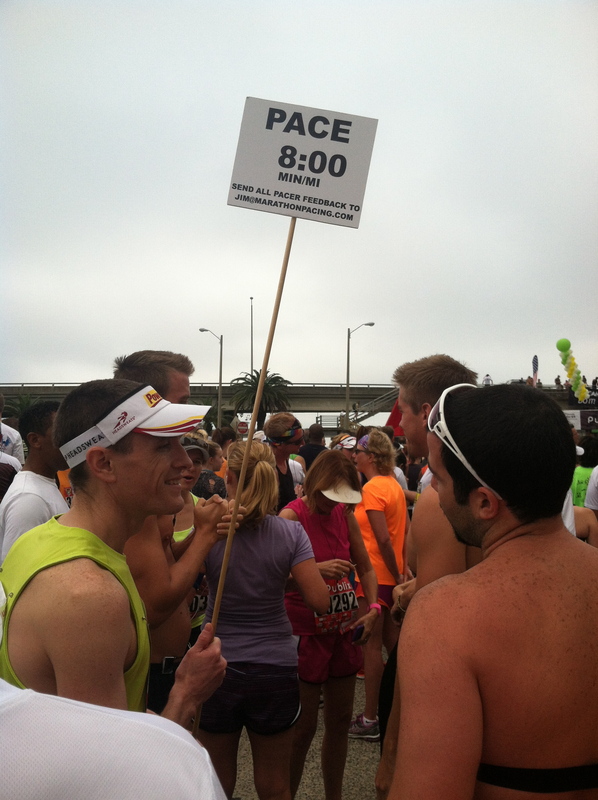 Mile 3: 8:01. At this point, I was feeling the effects of going out so fast. Oof. This was starting to hurt. I could feel myself slowing down but all I wanted to do was catch up to the pacer. My body was just not having it. To make matters worse, the sun decided to make its debut for the day. And boy, did it come out blazing! I was so hot and so tired, but I still had a mile and a half to go. You can do it Steph, you can do it, I kept chanting to myself. Then my thoughts switched to: No one will blame you if you start to walk. No!- I pushed the negativity aside and told myself that I could do it- only 1.5 miles to go! I gave what I could for that last mile and crossed the finish line in 41.05! 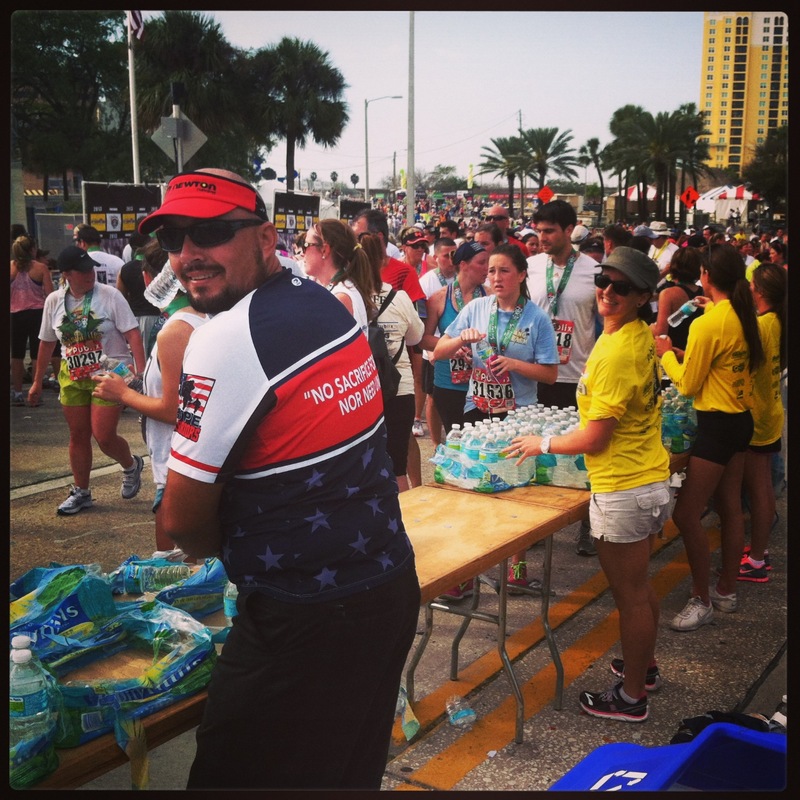 I headed down the chute and saw some friendly faces handing out water. I also spotted my friend Beth, who is super speedy and was the 3rd overall female to cross the line. Congrats Beth! Overall, I had a great time running the 8K. 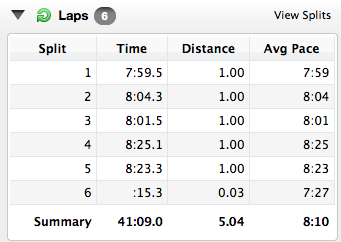 It’s a fun distance that isn’t raced all that often. 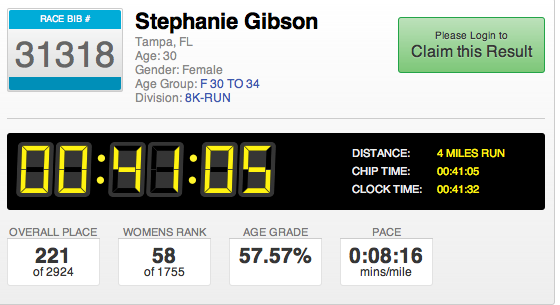 I was quite pleased with my time and my overall results. 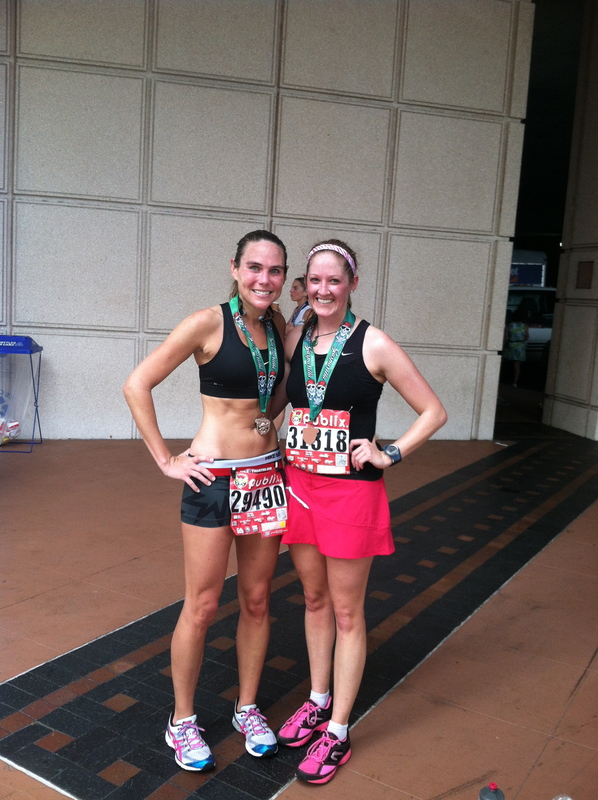 After the race, Mary (who ran the half marathon and scored a new PR!) hosted a delicious brunch where we recounted our races and threw out the idea of running the Challenge (all four races!) next year…I had a fantastic day and I have nothing but good things to say about the race and the race weekend. So, will I “Run for the Booty” next year? We shall see! Great job out there girlie! 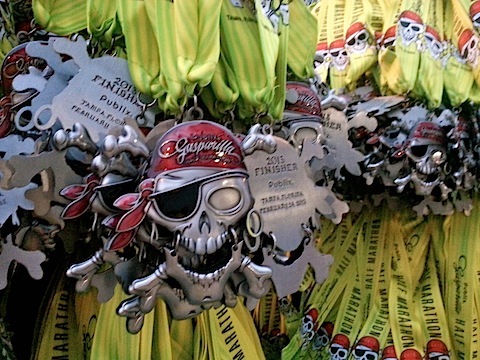 I sooooo missed Gasparilla this year, but I will definitely be there next year. The whole weekend is just so fun. Congrats on doing so well in your first race as a 30-year-old! And way to push yourself! You never cease to amaze me with your athletic prowess. 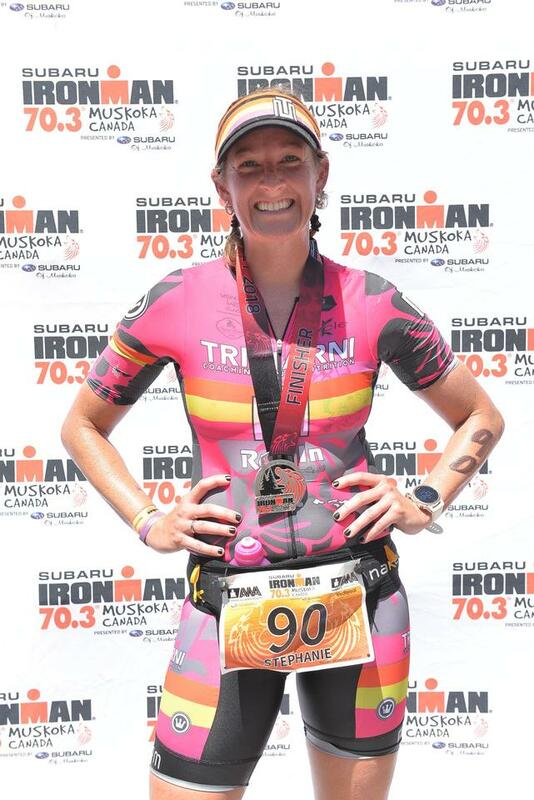 Way to go Steph! Those are some speedy miles!